A perfect bound, 6" X 9" paperback version in Black and White of Captain Mike Ray's very popular (but pricey) A32o manual. Contains all the same information, but does not lay flat. About 400 pages of information written for the professional. 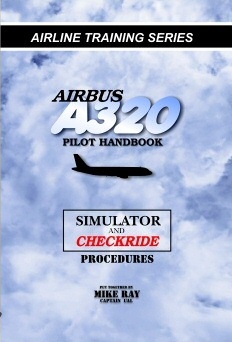 This manual contains all the information needed to not only pass an airline-style check-ride ... but it has every step described in intricate detail to operate the jet from Cold-dark start to parking/secure. Extremely popular with Airline Pilots and Flight simmers alike, it represents the bestseller at www.utem.com.